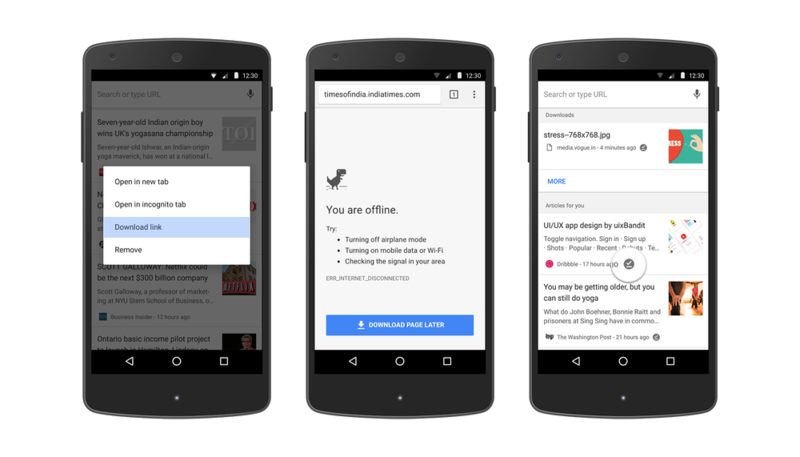 Google chrome for android added a new download feature in December 2016. The feature allows users to download music, videos and full web pages for offline viewing. Google chrome for Android had just received an update that will make it easier to download web pages for offline viewing. Well, Google is really making some awesome changes to its chrome browser for android. Previously we have seen Google introduces ‘Data Saver’ mode just to ensure web pages load faster on slower connections. To recall, Google chrome for android added a new download feature in December 2016. The feature allows users to download music, videos and full web pages for offline viewing that means users can save the entire web page to access it later without internet connection. Google chrome for Android had just received an update that will make it easier to download web pages for offline viewing. The reason why Google is trying to make things easier is because more than 45 millions web pages are being downloaded with Chrome each week. So, what the latest update brings? Well, users now just need to long press on any link in Chrome browser and then select the option “Download Link” to download the full web page. Moreover, Google chrome for Android also added a “Download Page Later” button which will only surface if you want to visit a web page but you are offline.